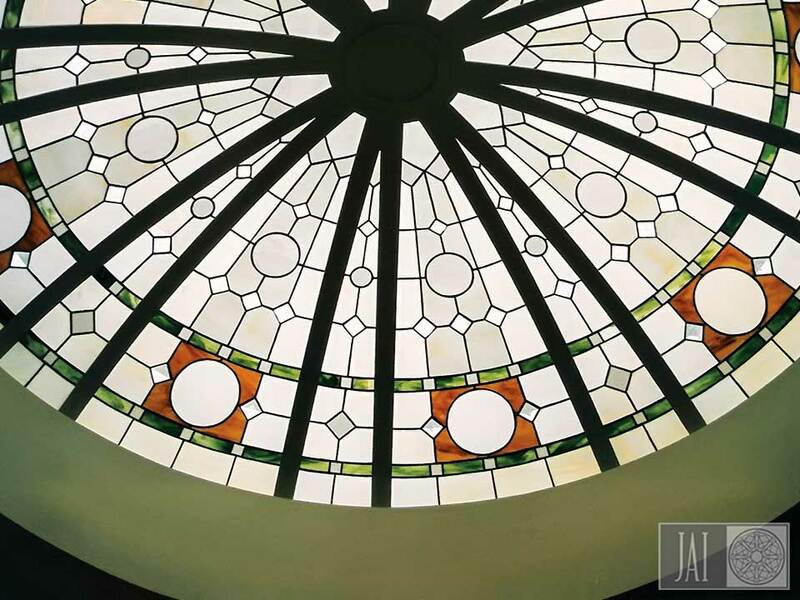 On this page you will find our art glass and metal work offerings including leaded stained glass domes and skylights, vertical walls, and light fixtures. 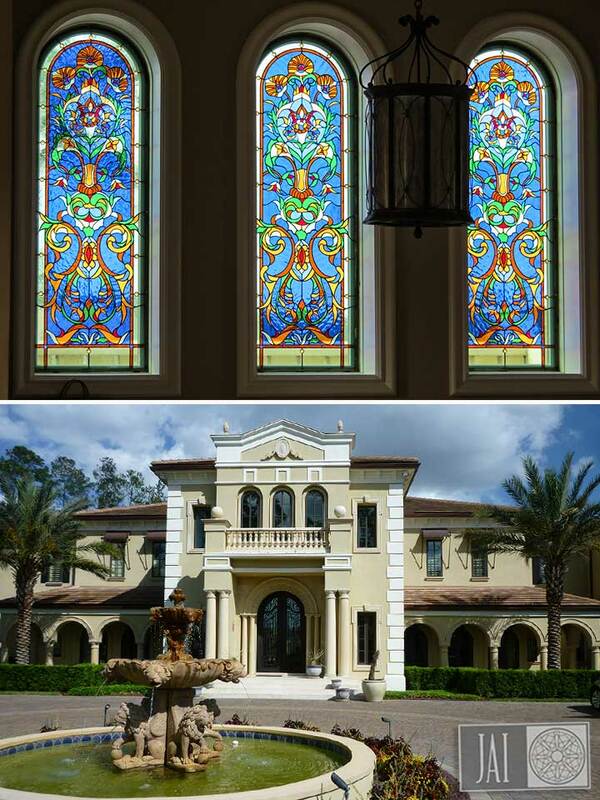 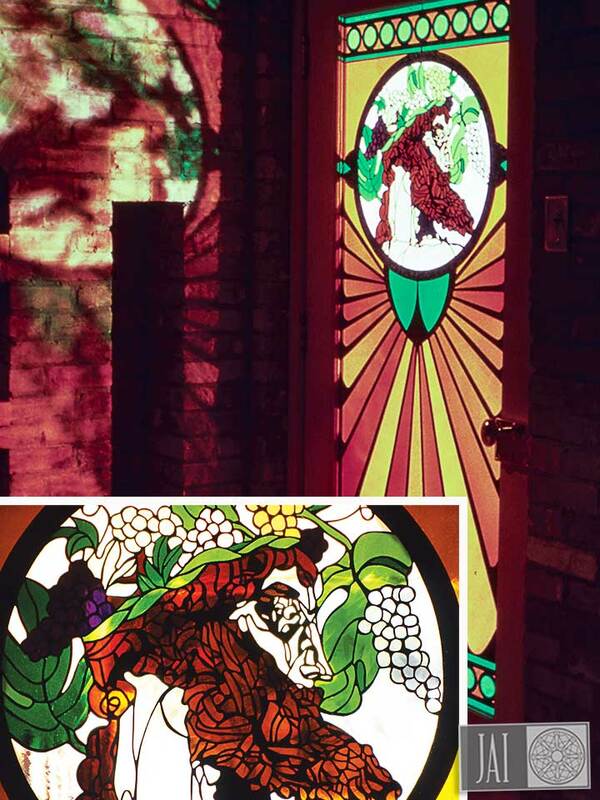 Constructed in our Ocala, Florida, stained glass studio, these custom stained glass designs are tailored to each project’s unique design direction. 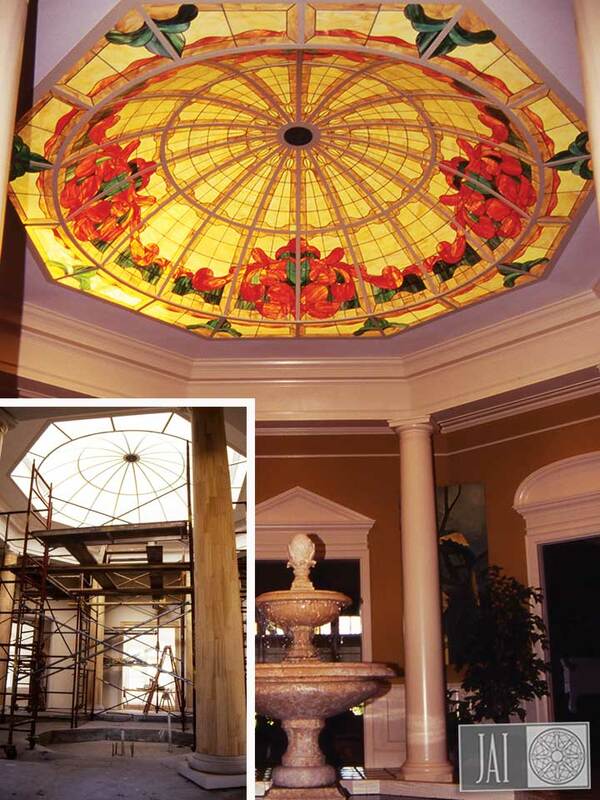 Visit our Case Studies page for more information about some of these projects. 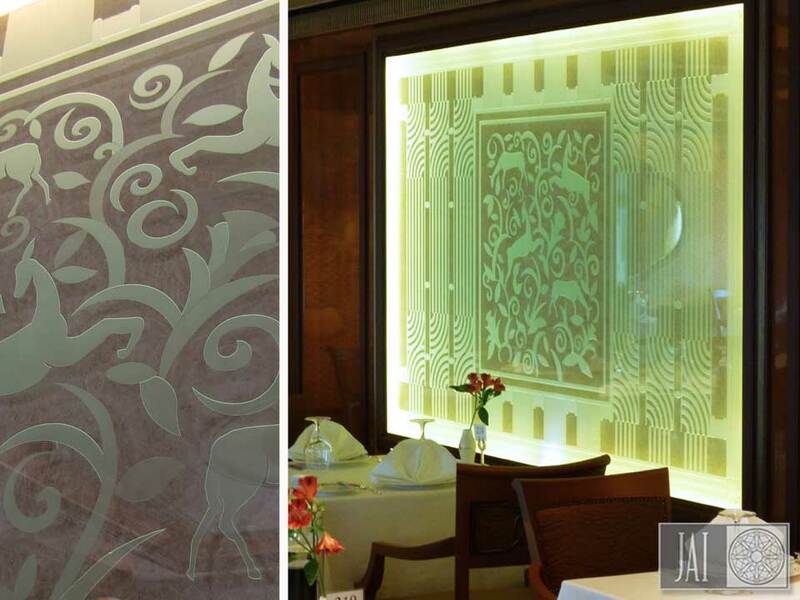 Our carved glass art is a deeply etched, multi-staged sandblast, featuring a sophisticated white contrast on Starphire clear glass. 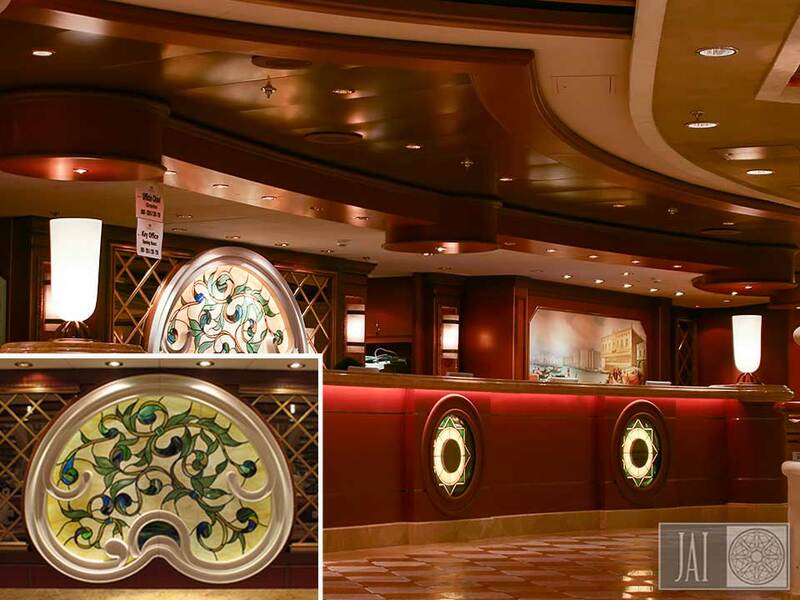 Cast Glass, more correctly called Slumped Glass, is sculptural in nature and a popular choice for those who desire dimensional glass void of color. 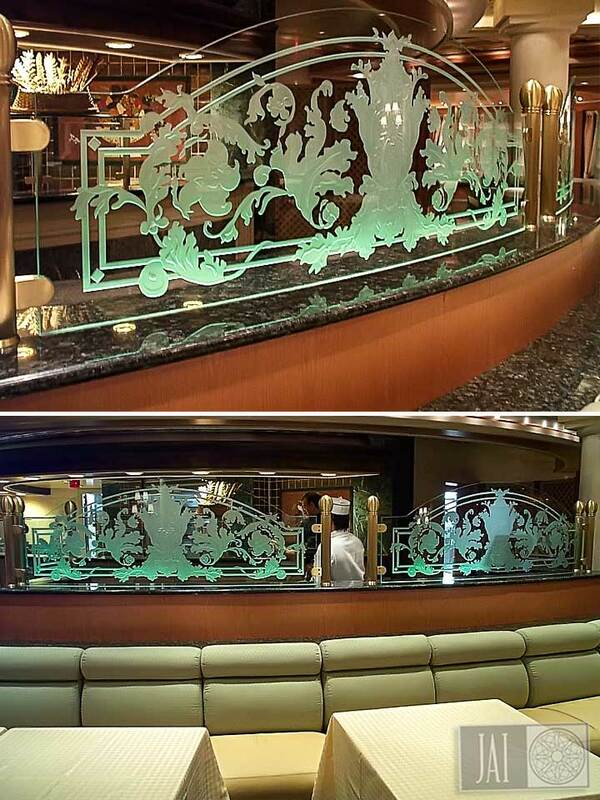 Typically 3/8″ to 1/2″ thick, cast glass can be installed in all applications where plate glass might otherwise be used. 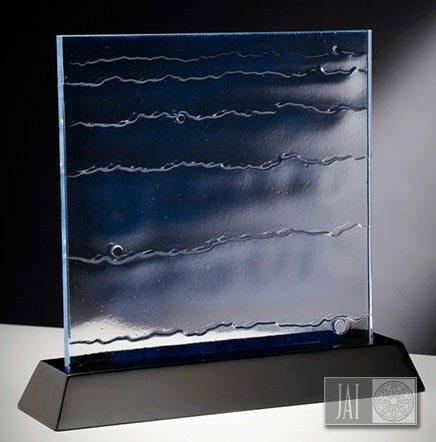 Another visually similar product is our new line of Fire-Polished Glass. 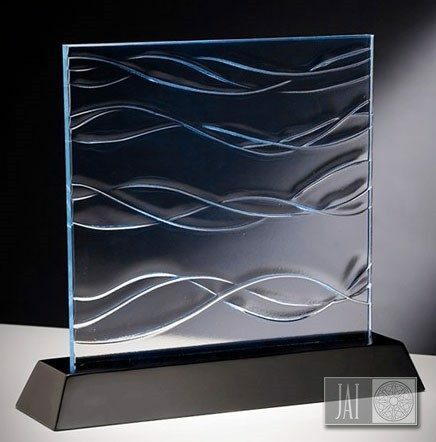 Unlike cast glass, this technique is not dependent upon molds, thereby greatly expanding the design possibilities. 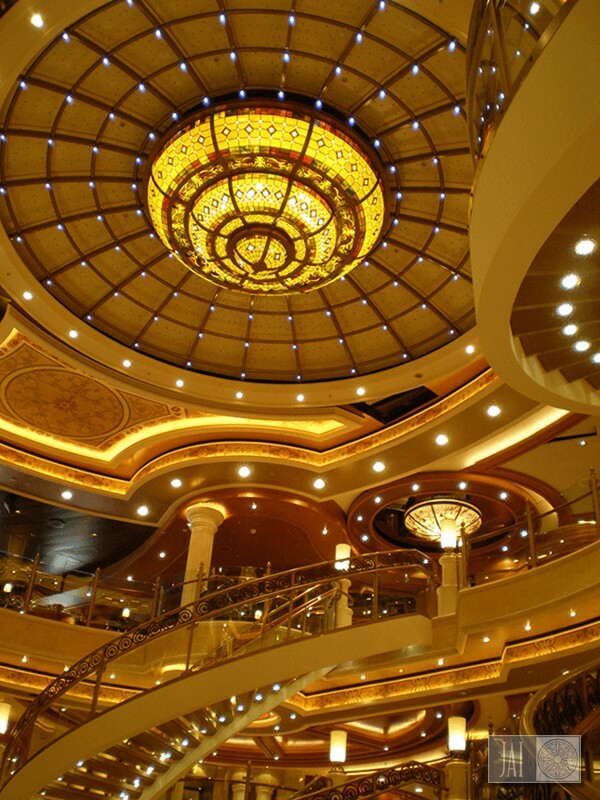 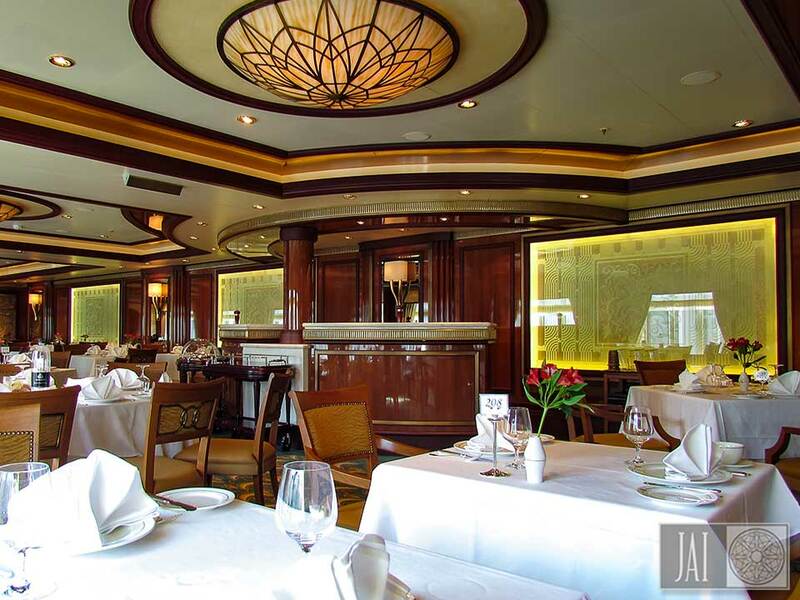 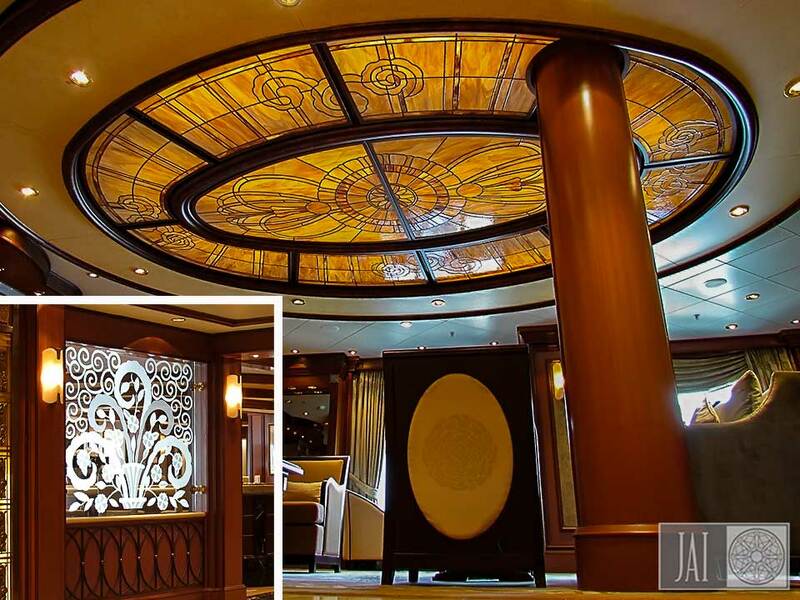 Decorative fabricated metal in materials ranging from copper and brass to aluminum and steel define our architectural grill work, sculpture, and decorative ceiling panels. 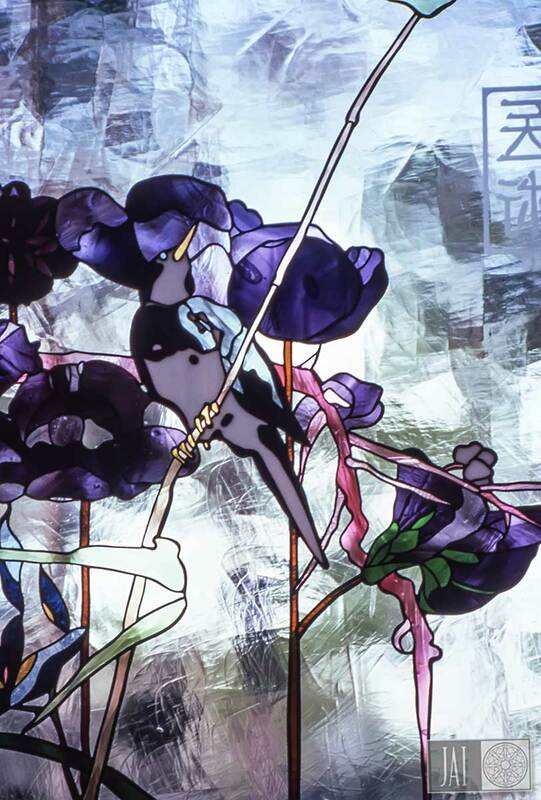 A natural companion to art glass, our art metal creations often marry the two, resulting in a truly unique dimensional, textural, and colorful work of art. 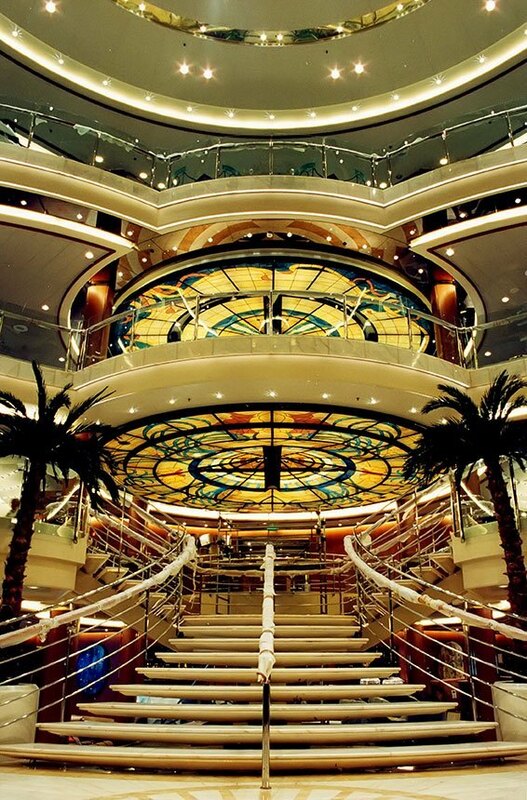 Use the filter tabs to focus your interests. 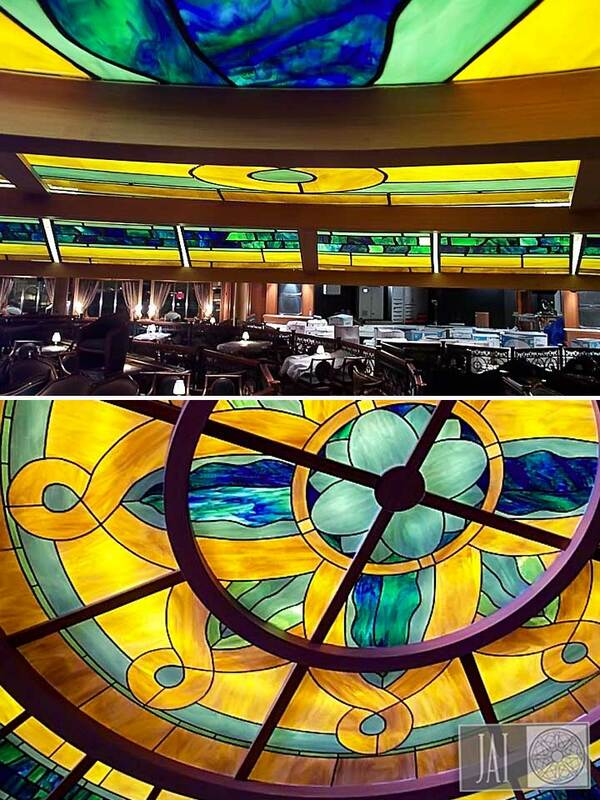 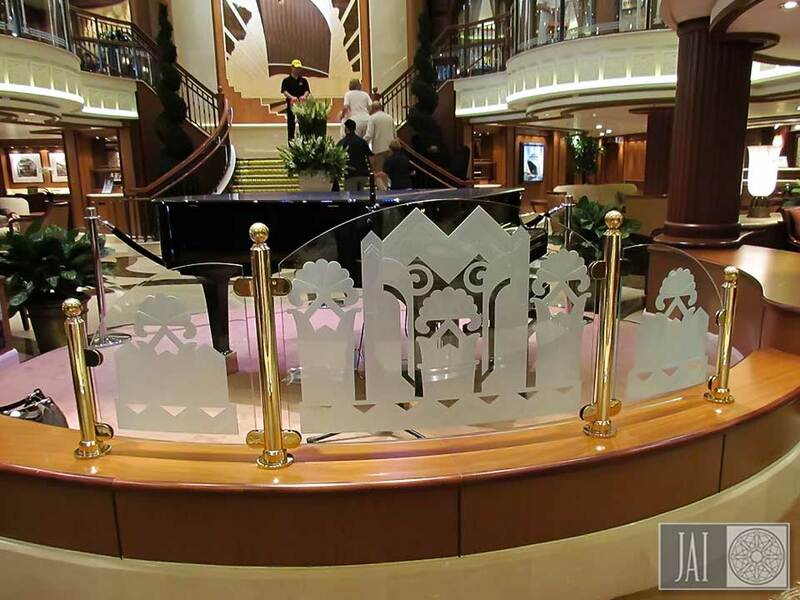 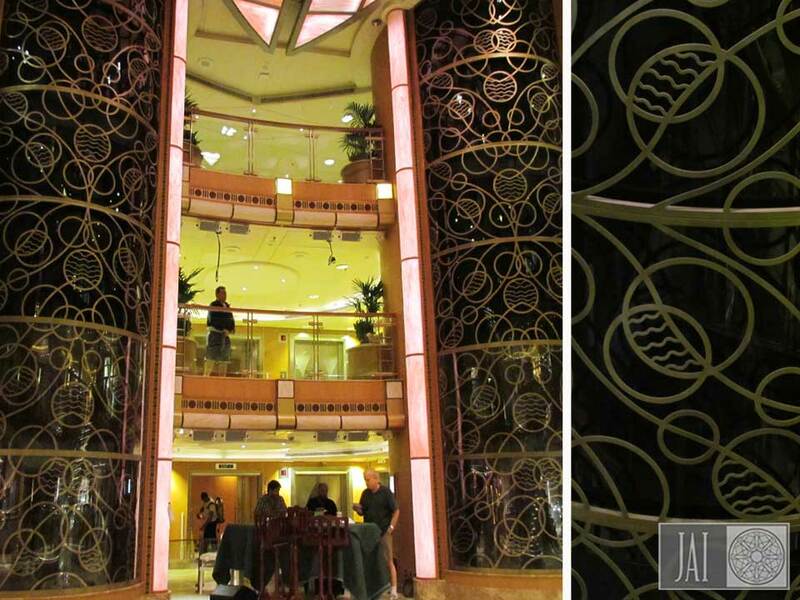 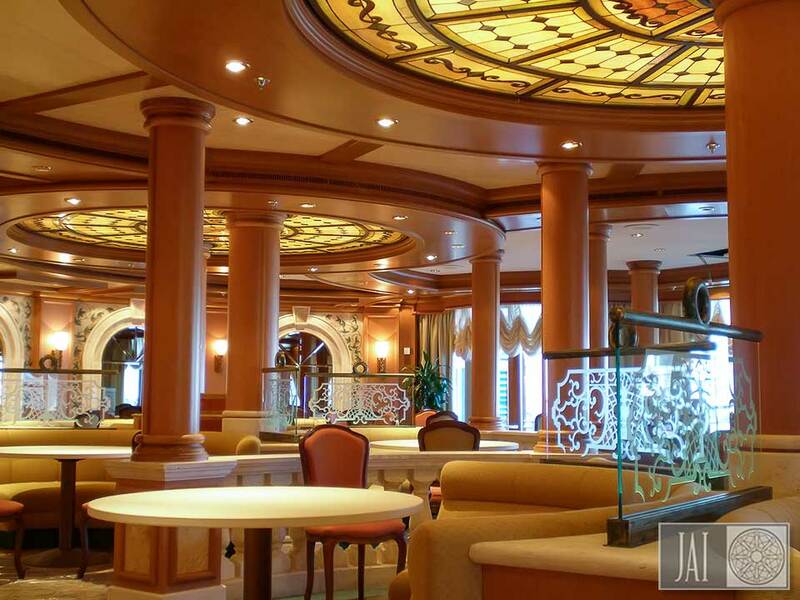 Carved glass dividers and twin stained glass ceilings above the Sabatini restaurant aboard the Ruby Princess. 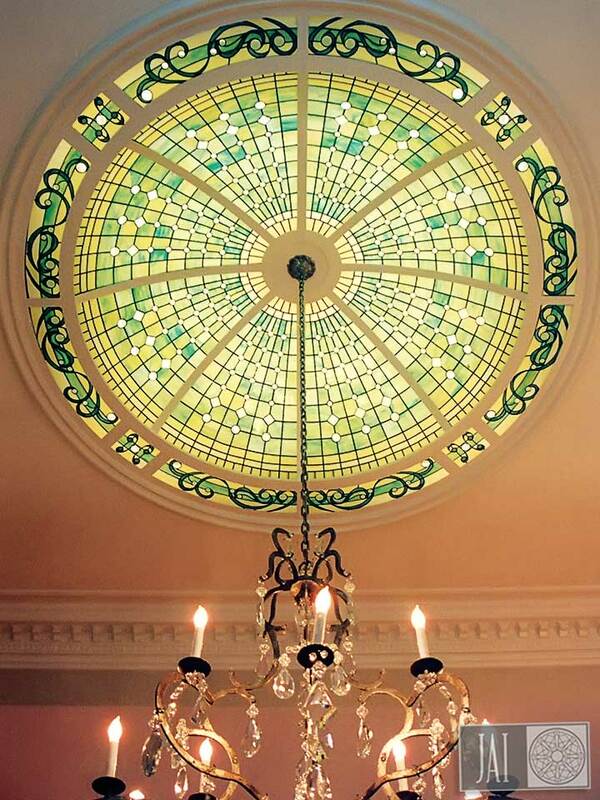 This stained glass dome graces the ceiling of a Latter-Day Saints temple waiting room. 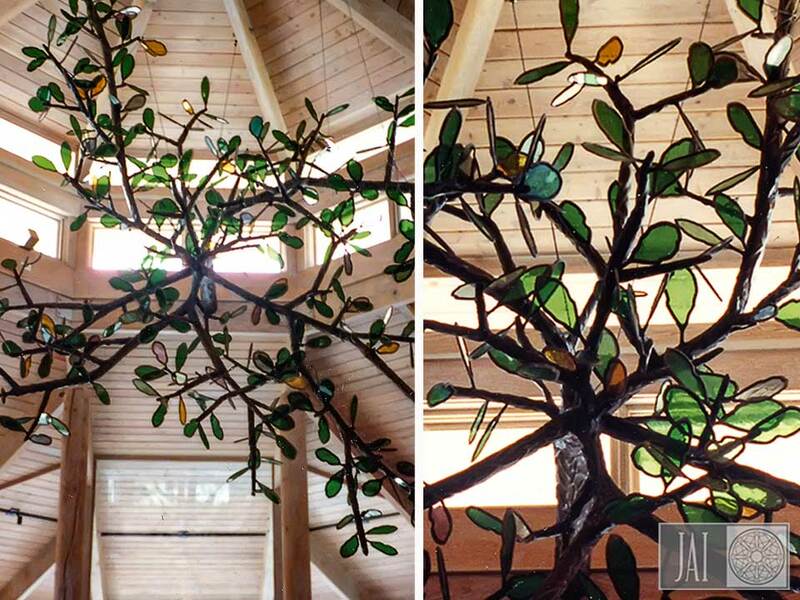 An 18' by 11' bronze, augmented with 500 stained glass oak leaves. 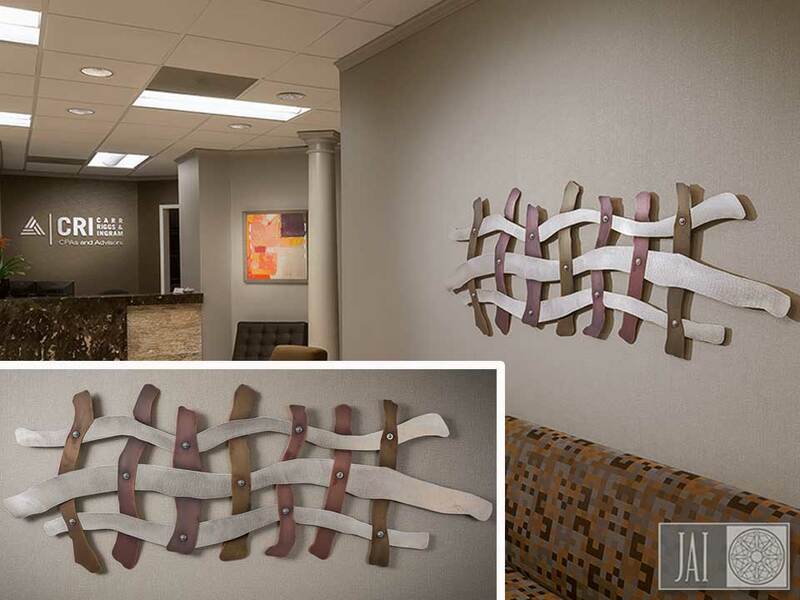 A unique woven wall sculpture 72" long made of brass, copper and stainless steel. 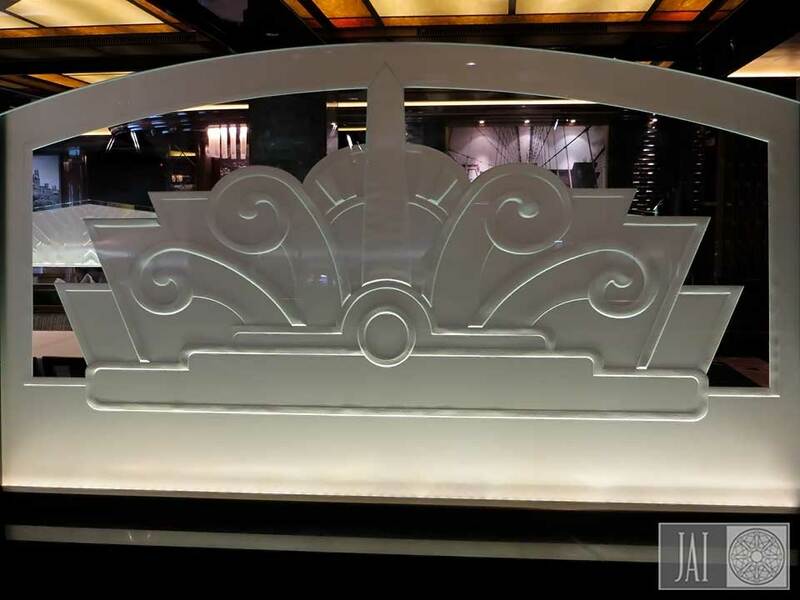 Aluminum space play station for Royal Caribbean Cruise Lines. 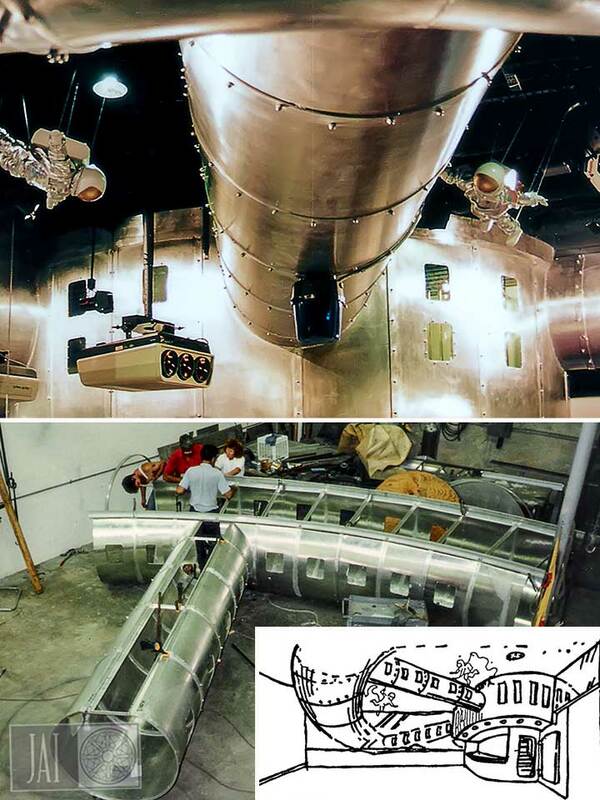 From concept to construction to installation. 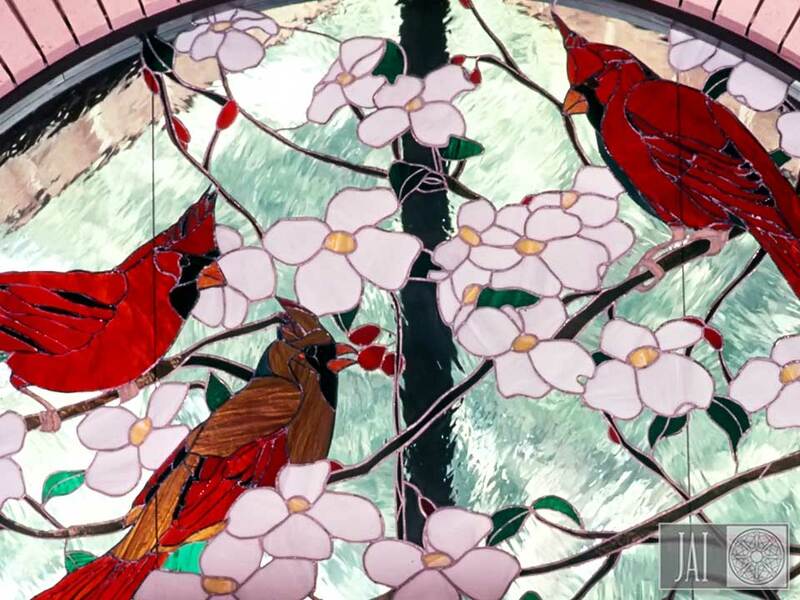 A 5' half circle transom above a double door entry featuring the farm's theme with intricate details of three red cardinals. 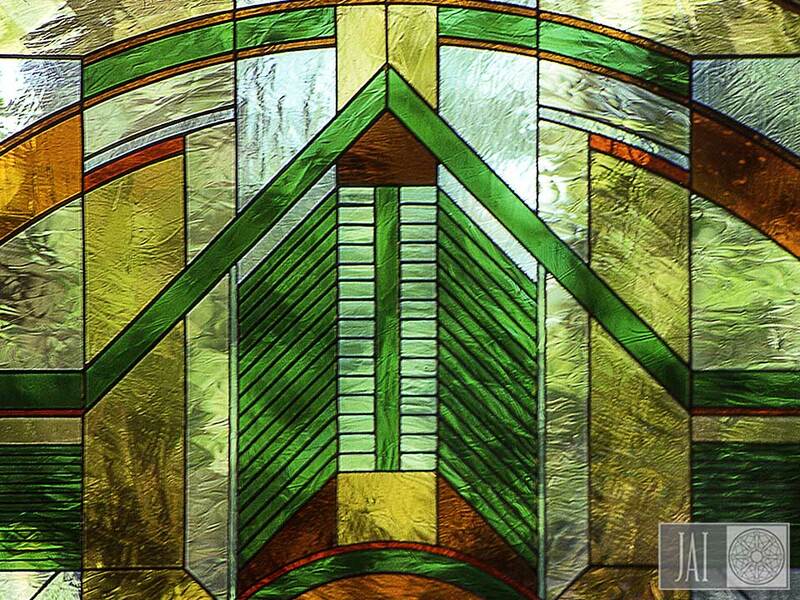 This stained glass window is notable for the intricate cuts needed to preserve the uninterrupted sections of background glass. 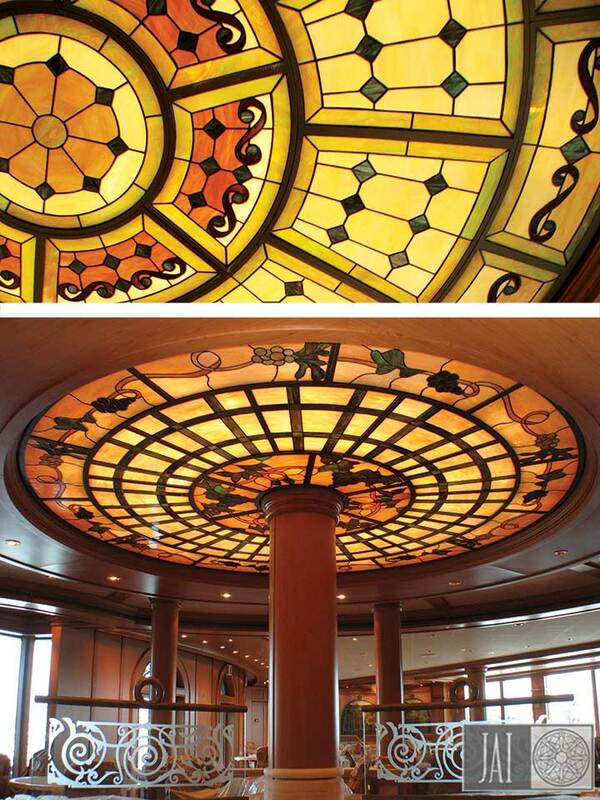 Rotunda 14' Stained Glass Dome. 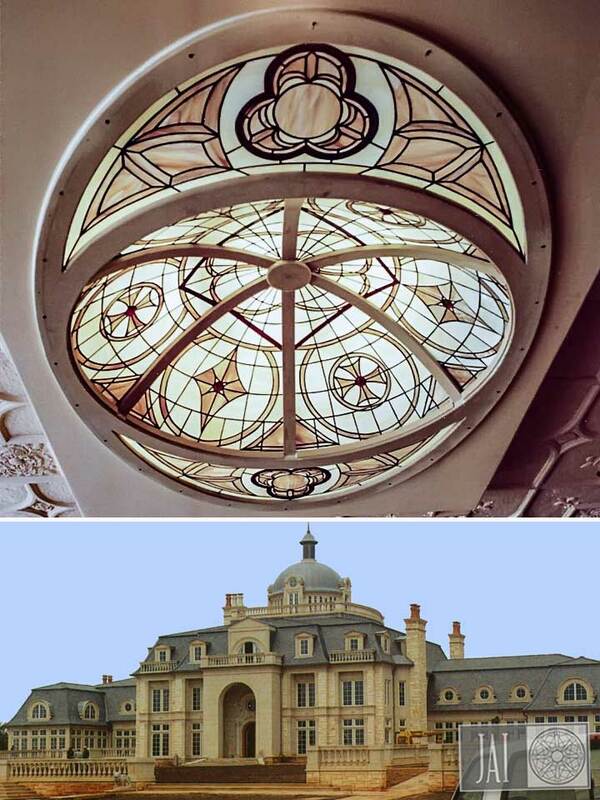 A 14' diameter stained glass dome for entry foyer. 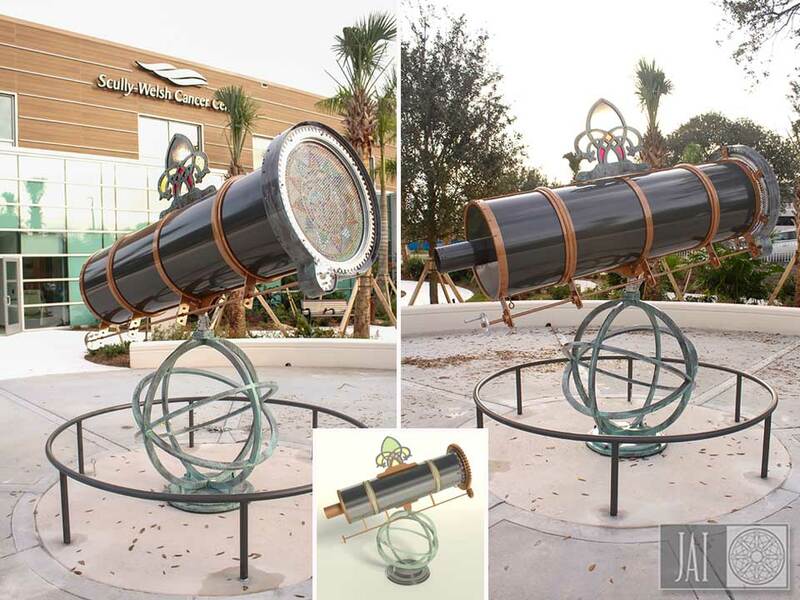 A fully functional kaleidoscope commissioned by the Indian River Medical Center Foundation for the heart of the Scully-Welsh Cancer Center Healing Garden. 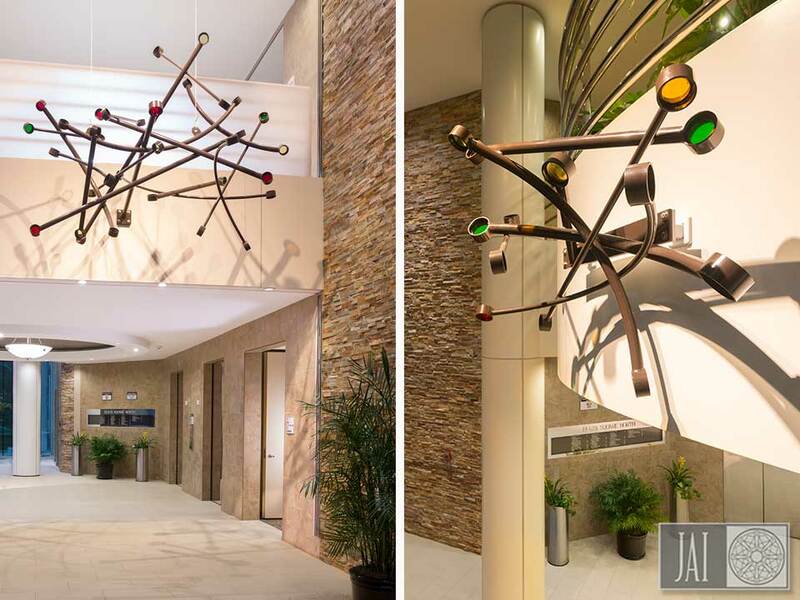 A pair of large metal sculptures accented with glass details featured in the lobby of this high rise office building. 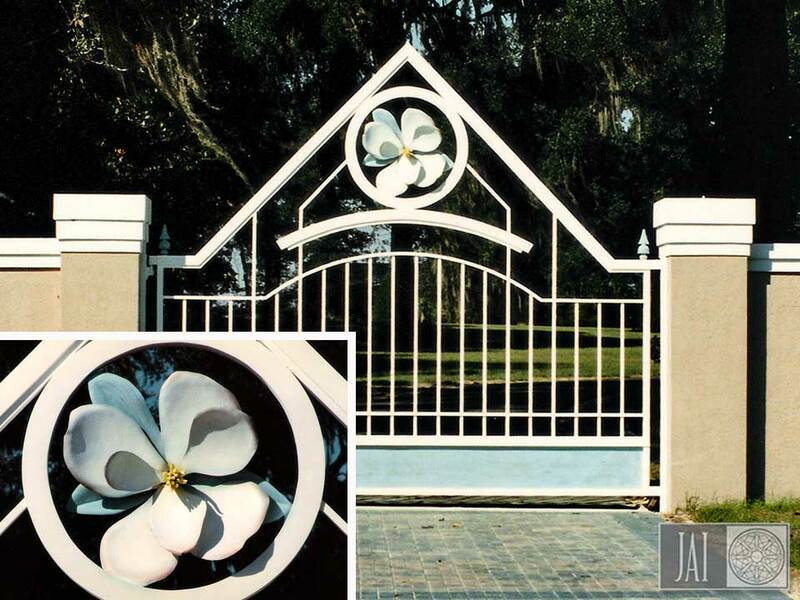 Large aluminum entry gate enhanced with a forged magnolia flower.